When considering a slice of pizza, most would see cheese, sauce, crust, maybe a topping or two. What Dr. Pawan Takhar sees is movement of fluids through a porous matrix, a structure undergoing constant change and requiring consideration of concepts such as mass exchange, viscoelastic properties, fluid transport and other physico-chemical processes. In sum, what Dr. Takhar sees in food is physics. And seeing food through the lens of physics has allowed Dr. Takhar to address significant challenges in food processing, with significant results for food quality and industrial efficiency. The uncommon approach taken to addressing food processing challenges reflect Takhar’s own unique background in food science. On the path to obtaining degrees in Agricultural Engineering from India’s Punjab Agricultural University, Post Harvest and Food Processing Engineering from Thailand’s Asian Institute of Technology, and ultimately a Ph.D. in Food Engineering from Purdue University, Takhar also held positions as a software programmer for an information technology consulting firm, and as a design engineer for a refrigeration and food machinery company. Now an Associate Professor in the University of Illinois at Urbana-Champaign Department of Food Science and Human Nutrition, Dr. Takhar brings a unique blend of physics and computational modeling to the analysis of food and food processing methods such as drying and frying. Takhar’s approach stems from continuum mechanics, a body of physics for studying laws of mechanics and material behavior by treating matter as continuous. Foods are not simple materials where simple statements of physics laws easily apply; foods are continually changing (due to temperature, pressure, etc. 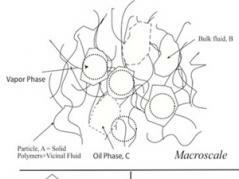 ), and need examination at micro-, meso-, and macro- scales. However, studying all the changes starting at the smallest micro-scale level and applying it for the whole food material would require an impractical level of computing resources and microscale material properties. To remedy this need, Takhar and his group use (and improve upon) hybrid mixture theory (HMT), which scales up from the micro level to higher scales to generate mathematical laws specifically for food and biomaterials, and which are more general than laws produced for simpler materials. In practice, the researchers combine HMT and macroscale or microstructural experiments (using data from X-ray tomography, scanning electron microscopy, etc.) to investigate a particular science challenge. Demonstrations of the strength of Takhar’s approach in improving food quality, nutrition, and industrial energy are found across multiple industrial food processing settings. In the soybean oil industry, the amount of oil extracted from soybean flakes results from the equipment used and the physical, thermal, and viscoelastic qualities of the soybeans in the feed stream. Takhar’s group was able to model the factors involved to produce soybean drying profiles and flaking roll performance adjustments that ultimately saved $2 million for one industrial producer. Stress cracks in corn are a problem for the corn processing industry, as cracked grains are a source of inferior quality products, produce more dust, and are more prone to insect and microbial damage. Typically, stress cracks arise from moisture fluctuations and drying times, but experimentally identifying the best combination of moisture and drying time would take a great deal of experimentation. By simulating the moisture/drying process, Takhar’s group was able to generate a graph of intermittent drying times, resulting in 50% less stress cracks in a food material. For industrial frying of rice crackers and potatoes, Takhar has been able to find the frying conditions at which both products are at the most desirable level; any further frying only results in excess oil absorption, which represents waste, poorer food quality, and even a greater risk for obesity in consumers. Currently, Takhar and his group are applying their approach to biopolymer expansion in the form of starch extrusion, with the goal of finding the optimal moisture and temperature distributions of a variety of starch-using products, ranging from cereals and snacks to lubricants for gloves. Looking to the future, Takhar sees a wealth of research possibilities on applying porous media theories to solve transport problems in foods such as frying, drying, freeze-thaw cycles etc.. In the next step Takhar will also be using molecular-scale simulations with food and bio materials via molecular modeling, molecular visualization tools and supercomputing resources. Please see Dr. Takhar’s website (fshn.illinois.edu/directory/ptakhar) for more information.